In this disposable age where people buy, use and throw items away once broken, it’s refreshing to come across a bike shop like Outdoor Cycles. 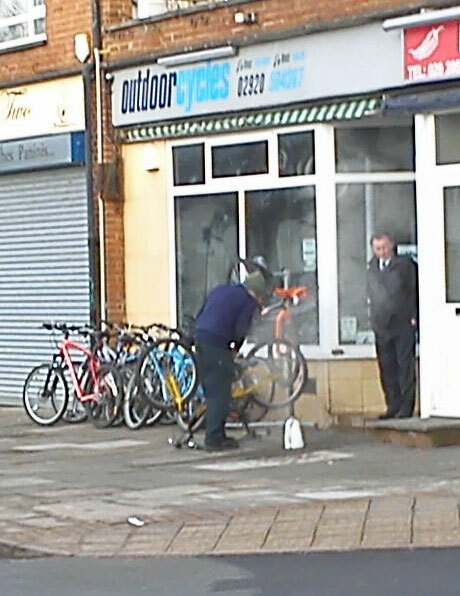 Michael, its owner and chief mechanic, reconditions and then sells used cycles in “Cardiff’s largest used bike store”. He also services and repairs bikes. Michae’s learning Welsh and some of the staff are students at Ysgol Plasmawr. I love the blackboard in the workshop with Welsh equivalents for technical biking terms like worn-wedi gwisgo, chain-cadwyn, etc. Michael has repaired two of our bikes: my son’s mountain bike needed brake adjustment and mine needed a new bottom bracket bearing and a few other adjustments and I was pleased with the service offered. I bought my bike second-hand from Mike, the owner of Outdoor Cycles, in September 2013 at a really good price at £85 to use to get to uni and local shops. It looked brand new and I was really pleased, especially when I then purchased a basket to go on the front, which Mike fitted in exchange for my home-made cherry and coconut flap-jacks! Every year since I’ve taken my bike there either to have a service or the tyre repaired, because I prefer to have Mike do these jobs.